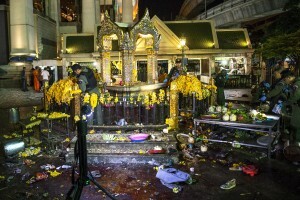 A bomb exploded inside a popular Hindu shrine during the evening rush hour Monday in Bangkok killing at least 16 people and injuring more than 80 people, according to wire reports from the Thai capital. The Erawan shrine is a major tourist landmark. It is located at Rajprasong intersection, the center of many political demonstrations in recent years, according to the Associated Press. A second bomb was found at the scene but has been detonated, a spokesman for Thailand’s ruling junta said. Secretary of the National Security Council said Prime Minister Prayut Chan-o-cha, the former army chief, was closely monitoring the situation. The last major bombings in Bangkok occurred at the end of 2006 on New Year’s Eve, when a series of bombs at the celebrations around killed at least 3 people and wounded dozens. There was speculation that supporters of ousted Prime Minister Thaksin Shinawatra carried out the attacks in revenge; however, the bombings were never resolved.